A COMMON complaint I hear from developing players concerns speed control. Not only do many players tend to hit the cue ball significantly harder than necessary, it�s especially easy to overhit softer shots. Often, the root of the problem is in the follow-through. When you have to use a firm stroke, it�s easy to allow the cue to go through the cue ball and come to a stop naturally. But when using a softer stroke, players are more likely to decelerate their cues in mid-stroke to reduce power. Or some people try to poke or jab at the cue ball. Developing a proper � and natural � follow-through will help immensely when it comes to varying your speed. When it comes to how far the cue should travel after impact with the cue ball, there�s no hard and fast rule. The stroke is complete when the cue comes to a natural stop from its own momentum. You can�t think, �OK, the cue will stop exactly four inches past the point of contact.� Comfortably and smoothly deliver the cue to the cue ball and allow the stick to decelerate naturally. When you need to stroke the cue ball softly, you can shorten your backswing appropriately. For extremely soft shots, bring the cue back two or three inches; you�ll then have a follow-through of only an inch or two. Take a look at the diagram. You want to set up an angled shot on an object ball that won�t be too challenging, so you can really focus on the cue ball�s speed after impact. 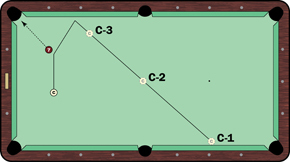 First, try to pocket the object ball and send the cue ball off the long rail and back across the table, to the cue ball marked C-1 in the diagram. Once you can consistently send the cue ball to within a reasonable distance of the target, shorten your stroke, decrease your speed and send the cue ball to C-2 in the center of the table. Your backswing and follow-through should be shorter. Finally, aim for C-3. Again, with an exceptionally soft stroke, you should shorten your backswing and follow-through. Working on the same shot at different speeds is a great way to efficiently improve your cue-ball control.